Defence Minister Jaswant Singh yesterday warned Pakistan against misunderstanding India’s willingness to talk as its weakness and declared that the government was determined to root out terrorism from the country. More than 75,000 security personnel, including Delhi police and paramilitary personnel, backed by sophisticated equipment and aerial surveillance, kept a strict vigil to ensure incident-free 54th Independence Day celebrations in the Capital today. He has kept the fire of freedom burning for the past 54 years. In a remote village near Mangalodi, octogenarian freedom fighter Padoram Mahanta has kept the flame of India’s independence burning since he first lit it as a 25-year-old at the stroke of midnight on August 14, 1947. Undeterred by militants’ threat Meghalaya Home Minister T.H.Rangad today celebrated Independence Day in this bandh-hit capital town with his nine-year-old daughter without any security cover. Mr Rangad, who is on the hit list of the ultras, came out without security on the street which wore a deserted look owing to the 36-hour bandh call given by the banned HNLC. 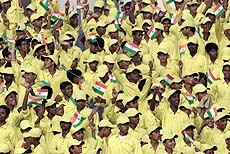 The Independence Day celebrations were held amid tight security at the local Ganga Singh Stadium today. Mrs Kiran Soni Gupta, Deputy Magistrate, took the salute at an impressive parade. Cockroaches are the latest addition to the luxury of Chandigarh Shatabdi Express. And the railways are fully aware of it. The Divisional Traffic Manager (Shatabdi Rajdhani services) noticed cockroaches in the Executive Class of Swarn Shatabdi while travelling to Ambala last month. 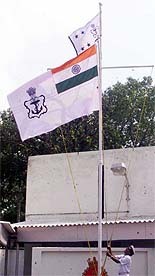 In a telling evidence against the Delhi police with regard to the 1984 riots, a then Sub Inspector has told the Nanavati Commission that amidst the communal carnage after the assassination of Prime Minister Indira Gandhi, he heard a voice on the wireless transmission service, instructing police personnel not to help Sikhs or lodge their complaints. Prime Minister Atal Behari Vajpayee did not approve of NDA convener George Fernandes’ mission to Kolkata to bring back Ms Mamata Banerjee to the Union Cabinet, BJP state president Ashim Ghosh claimed, quoting party’s all-India President Jana Krishnamurti and the PMO. Former Mumbai Joint Police Commissioner R.D. Tyagi, held in a 1993 communal riot case, was today remanded in police custody till August 23 by a Magistrate here. The District Primary Education Programme, has taken up a project to bring qualitative improvements in the primary education in the district. 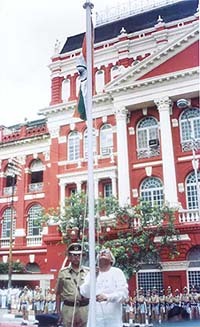 West Bengal Chief Minister Buddhadev Bhattacharjee unfurling the National Flag at the state Secretariat on Independence Day in Kolkata on Wednesday. In his address to the armed forces on the eve of Independence Day, Mr Jaswant Singh said Pakistan would have to stop aiding and abetting terrorism in India and also cease all anti-India propaganda. “Pakistan’s policies and behaviour against India are clear. That country is continuously supporting cross-border terrorism in various parts of India. Pakistan will have to stop all this for peace and progress in the subcontinent and also cease all anti-India propaganda,” he said. India had asked Pakistan time and again to stop aiding and abetting terrorism and favoured the resolution of all outstanding issues through negotiations. With this intention Prime Minister Atal Behari Vajpayee had extended a hand of friendship to Pakistan and invited President Pervez Musharraf to New Delhi for talks, he said. “Our intention to resolve all disputes through negotiations is proved by our acceptance of invitations to visit Pakistan despite not having reached any agreed statement at Agra,” he said and hoped that Pakistan would understand the realities to mark the beginning of a new era. Lauding the role of the defence forces in various spheres, including anti-insurgency operations in Jammu and Kashmir and the North-East, disaster management and UN Peace keeping operations besides guarding the country’s frontiers, the Defence Minister said the responsibilities of the armed forces had increased manifold in the context of the changed global scenario. Mr Jaswant Singh appreciated the role played by various wings of the defence forces including the Coast Guard, Rashtriya Rifles and the Border Roads Organisation (BRO). The Red Fort, from where the Prime Minister, Mr Atal Behari Vajpayee, addressed the nation, was turned into a virtual fortress, with security arrangements well in place 24 hours before. The entire area was once again swept for explosives early in the morning despite the fact that entry to it was restricted only to authorised personnel a day earlier. It was evident that the security personnel were not willing to take any chances considering the threat from several militant organisations and increased threat perception to some of the Cabinet Ministers. Commandos from the elite National Security Guards (NSG), specially trained in anti-terrorist operations, were stationed at all the vantage points around the venue even as helicopters maintained an aerial vigil and kept in constant radio contact with the forces deployed on the ground. Sharp shooters equipped with special telescope sight rifles were stationed on the roof-tops of adjoining buildings. The shops in the vicinity of the Red Fort were ordered closed since yesterday as a precautionary measure. A 3-km radius area around the Red Fort was sanitised. Even the movement of the trains at the nearby Delhi Main Railway Station (Old Delhi Railway Station) was halted during the one hour function as were the flights. Air defence guns and radars were also deployed at strategic locations around the venue as an added precaution in case of an aerial threat to the VIPs. For the first time, women came under closer scrutiny by the security personnel because of the Fidayeen threat. Women visitors to the function were thoroughly searched. Even the hairdos came in for search to detect hidden explosives or weapons. Meanwhile, Delhi police officials said no untoward incident was reported from anywhere in the Capital and all functions to celebrate Independence Day passed off peacefully. Most of the venues of these functions, apart from the main Red Fort one, were identified earlier and security arrangements made there well in advance. Gurdhian Singh, Davendra Pal, Narinder Singh, Ramdeo Singh, Ashok Kumar Dixit, Pranab Kumar Misra, Hardip Singh Anjan, Ratan Chandra Das, Vir Singh Chandel, Shiv Ram, Ravat Singh, Niranjan Pathak, Yoginder Singh, Ved Prakash Sadh, Raghbir Singh Dogra, Bagga Ram, Uma Shanker Sharma, Budhram Gope, Ramesh Singh, Surya Pal, Om Parkash, Mahabir Prasad Yadav, Bikaram Singh Yadava, Shaja Nand Singh, Gupteshwar Singh, Mahendra Pratap Singh, Paras Nath Sharma, Gotam Singh, Sankar K. Karmakar, and Venkatarao Balaraja. He has kept the fire of freedom burning for the past 54 years. In a remote village near Mangalodi, octogenarian freedom fighter Padoram Mahanta has kept the flame of India’s independence burning since he first lit it as a 25-year-old at the stroke of midnight on August 14, 1947. Far removed from the limelight of media or the hurly-burly of politics, Mr Mahanta is today disillusioned with the overall decay of society. When the country gained freedom, Mr Mahanta celebrated it differently — he rustled up some wood and ignited a fire at the stroke of midnight — and vowed to keep it burning as long as he was alive. This has ensured that he has hardly spent a night away from home. From a big fire in his courtyard, he has, over the years, reduced it into a torch made of hay. Mr Mahanta has neither sought the attention of the public nor the media for his patriotism, and barring a felicitation by a local club, has never been recognised officially. Only at the twilight of his life has he got some attention. Undeterred by militants’ threat Meghalaya Home Minister T.H.Rangad today celebrated Independence Day in this bandh-hit capital town with his nine-year-old daughter without any security cover. Mr Rangad, who is on the hit list of the ultras, came out without security on the street which wore a deserted look owing to the 36-hour bandh call given by the banned Hynniewtrep National Liberation Council (HNLC). A 36-hour bandh, also called by the banned outfit, the HNLC, was also on in four Khasi dominated districts of the eastern part of the state. Independence Day celebrations passed off peacefully in Mizoram even as the Mizo Students Union (MSU) declared the day as a “black day” protesting against introduction of sales tax in the state. National Liberation Front of Tripura (NLFT) militants shot dead three brothers, including a CPM activist, in West district late last night on the eve of the country’s 55th Independence Day. The police said in Agartala today armed militants raided the house of CPM activist Subhendra Debbarma at Mahendrapara under the Champahour police station, dragged him and his two younger brothers out of the house and and shot them dead on the spot. In Assam the boycott of Independence Day celebrations and a general strike called by 12 underground militant organisations of the North-East, today evoked no response with people turning out in large numbers for official functions in all district headquarters, official sources said in Guwahati. More than 300 journalists from both print and electronic media observed a token fast in Chennai on Independence Day today, protesting against the attack on media personnel by the police during the DMK rally in the city on August 12. The three-hour-long function started at 9 am. The cultural function was presented by hundreds of schoolchildren. Senior officers of the administration besides eminent personalities of the city were present on the occasion. As many as 49 persons who had excelled in their respective fields and students who had topped at the district level in the board exams were honoured by Ms Gupta. 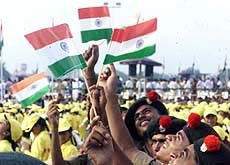 Ms Gupta unfurled the national flag and later took the salute from the marching contingents of the local police, the state armed police, NCC cadets, Scouts and Guides, Border and Urban Home Guards, the BSF and schoolchildren. After this a message from the Governor was read out. The highlight of the function were the colourful tableaux depicting the achievements of the state. The tableau of the Forest Department was adjudged first followed by those from the Health and the Forest Departments. The tableaux were taken out in the procession through the city. 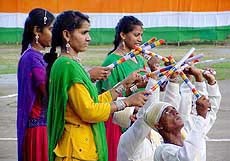 The all-girl band of Guru Nanak School regaled the audience with the tunes of patriotic compositions. Apart from causing inconvenience to about 500 passengers who travel by the train everyday, cockroaches play hide-and-seek with members of the catering staff who find it difficult to keep the food out of their reach. But, the deficiency of service on part of the railways does not end here. A first hand experience on board an AC chair car coach on August 4 and a look at the complaint book brings to light several complaints by passengers. Speaking on condition of anonymity, railway staff told TNS that a deficiency report on every coach is sent to Delhi everyday. He said the rake goes to the Amritsar washline where it is cleaned. Apart from this, the railway staff inspects all the coaches, including eight chair cars and an executive class. The average passenger carrying capacity of the AC chair car is 67 while the executive class can carry 46 passengers. The total passenger carrying capacity of the train is 582. On an average, about 350 to 450 passengers travel by the train during off season. At peak season, during the festival rush, the railways augment the capacity with a chair car coach to clear the waitlisted passengers. Although the railway staff claims that the train is cleaned in Chandigarh and the catering portion is disinfected everyday, the hygiene and sanitary conditions on the train leave much to be desired. The toilets stink and one has to perfume ones nostrils to answer the call of nature. Layers of dust between the windows discourage passengers from enjoying the refreshing view of the countryside. While leafing through the complaint book, this correspondent came across several complaints revolving around poor service and lack of basic amenities. Dissatisfied with the services, some passengers have even questioned the steep fare for a journey by the train. Another complaint describes ‘perpetual leakage of water’ in one bathroom. In a complaint dated July 1, Brigadier B.S. Parmar, a resident of Meerut, has drawn the attention of the railways to “no water supply in toilets”. Similarly, M.L. Gupta, a resident of Baddi, has complained that the toilets had not been cleaned properly. In a complaint dated April 25, Rajesh Madan, a passenger from Gurgaon, has stated that windows are dirty and have “not been cleaned for ages”. Yet another complaint dated April 23 says the STD machine shows fake reading. A resident of Cavalry Lane, Delhi, has suggested that newspapers be made available to all passengers. He said he carries out surprise checks at random. He said that complaints made by passengers are sent to him everyday and processed through a complaint computer management system. These are then investigated and sent to respective departments. He said he replies to all such complaints. Hari Nihal Singh, who was posted in the “Hindu section’’ of the CID at police headquarters, said he also heard another instruction on the wireless, prohibiting cops from recording any message on the transmission service regarding incidents concerning the Sikh community. Mr Ghosh said Fernandes had flown down to the city on Thursday to attend the Martyrs’ Day function of the Trinamool Congress, not on behalf of the NDA but as Samata Party leader. He was not authorised by the Prime Minister to negotiate with Ms Banerjee for bringing her back to the ministry. What Mr Fernandes did to invite her back, was done on his own and neither Mr Vajpayee nor the BJP leadership had the approval of his move, Mr Ghosh reiterated. Mr Ghosh’s statement caused a stir in the political circles, putting Trinamool Congress leader in embarrassment. 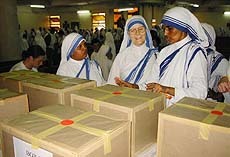 Ms Banerjee said she had accepted Mr Fernandes’ invitation but would wait for the Prime Minister’s call. She would respond to an honourable return. Mr Ghosh, however, said quoting the party President: “If Ms Mamata wants to be back, she will have to approach us personally and also give a written undertaking on NDA’s conditionality, restricting an easy entry as well as exit of the NDA”. Ms Banerjee left the NDA on the Tehelka issue in March, demanding Mr Fernandes’ resignation as Defence Minister. Mr Fernandes resigned but she still remained outside to join hands with the Congress to fight against the CPM in the state Assembly poll. Ms Banerjee reiterated on Saturday that they would support Vajpayee on national issues but would not join hands with the BJP’s state unit. She said, henceforth, the TMC also would not have any connection with the Congress and would “go it alone to fight the CPM out”. She declared that the TMC would give a call soon for an indefinite bandh in Bengal as GNLF chief Subhas Ghising did in the past in the hills demanding separate Gorkhaland. WBPCC (I) president Pranab Mukherjee said they still wanted all secular and anti-CPM parties to join hands and fight against the BJP and the CPM in Bengal. He squarely blamed Ms Banerjee to break ties with the Congress for her vested interests. Mr Somen Mitra, party state unit secretary, alleged Ms Banerjee’s double-standards had been exposed. She has greed for a ministerial berth and that is why, she again wants to join the communal BJP, remarked Mr Mitra, adding that it had been, however, a good riddance for them and for the people of Bengal. Tyagi, who was admitted to a Bombay hospital following complaint of chest pain yesterday, was not produced before the court. The District Primary Education Programme, has taken up a project to bring qualitative improvements in the primary education in the district. The five-year project will commence from October 1 and it would cost Rs 40 crore. Under the scheme in all primary schools basic facilities will be made available and teachers will be given training to bring quantitative and qualitative improvements. The training of teachers will continue for five years. Up to 2003, children between, the age of 6 to 14 years will be encouraged to go to schools. Efforts will be made to bring down the number of children who discontinue studies. Rallies and meetings will be organised to prepare an environment for executing the scheme. Hand pumps will be installed in the primary schools and toilets also will be constructed later. Three block officers and a project officer will be appointed in each office, from where primary education programme will be supervised. Sources said, out of total 1905 revenue villages, primary schools are being run in 1726 villages and 179 villages are deprived of primary schools. The scheme will provide basic facilities in 1726 villages and make available primary education in 179 villages. A total of 57 cluster offices will be established in the three blocks for the successful implementation of the scheme. These cluster offices will sort out the problems being faced in primary schools and will send the proposals. Under the scheme 60 per cent of total amount will be spent on training of teachers and rest of the amount will be spent on providing basic requirements in primary schools. For the scheme three posts of assistant project coordinators have been approved.